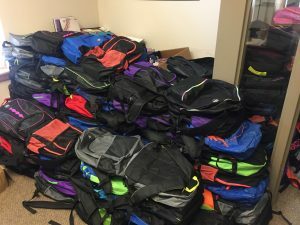 Parker Hill Church Donates Backpacks! We are extremely grateful to Parker Hill Church for their recent donation of 190 backpacks! They are filled with school supplies such as pencils, notebooks, folders and all kinds of educational supplies and goodies for the kids. We thank you for your generosity! A big shout out to Ryan Lecky from WNEP TV who highlighted the need for our youth on his morning broadcast!